We recently reviewed Jarritos' "Lime" flavor, which the bottle listed as "limon". This seeming inconsistency led me to some linguistic research into the proper Spanish translations of "lemon" and "lime", which apparently depends on a number of factors, such as the exact dialect of Spanish involved, the prevalence of lemons and limes (and apparently some third fruit) in the area, and possibly one's horoscope. However, Jarritos seemed to have weighed in clearly on the issue: the bottle of "limon" was translated as "lime", the soda was green, and it tasted of lime. One would think that the issue--as far as Jarritos was concerned--was resolved. 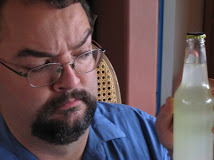 Today we are reviewing Jarritos Lima-Limon flavor, which the bottle translates as "lemon-lime". When I saw that, I was wracked by uncertainty. I felt my world tremble on its foundations, my sanity and rational worldview teetering, held in place only by the tenuous filaments of my belief in a sensible linguistic world. Which of those words means 'lemon'?, I gibbered. As far as I could tell, this was "lime-lime" soda! Nowhere had I found the suggestion that "lima" could mean "lemon". But how could "lime-lime" exist? Somehow, the very conception was abhorrent, as though the first and second limes would, rather than interacting in an additive fashion, coalescing into some sort of unspeakable uber-lime which might permeate the world with its eldritch citressence--they might instead cancel, resulting in a lime-shaped hole in linguistic reality, a hole through which one might glimpse the nightmarish, cyclopean fruity horrors which lurk behind the veil of conscious reality, horrors which whisper and insinuate in our subconscious minds, filling our dreams with nameless fragrances and half-remembered tastes of fruits unknown and unknowable. These seed-bearing, fleshy, pulpy abominations would not only be seen, but could then see, emerging into the sane sunlight world of conscious thought spreading their malign influence and shaping the world of words and literature into a pattern more subtly aligned to their unguessed purposes. To avoid this outcome, I have decided to enlist the help of the Kibbitzer-in-Chief's father, who is visiting the Lab today. As a Spanish speaker, perhaps he can help avert the collapse of civilization and sane expression. Me: "Pop, what's the Spanish word for 'lime'?" Me: "And what's the Spanish word for 'lemon'?" Me: "But the Jarritos lime flavor translated itself as 'limon'." Perhaps this is a mystery best left unexplored. Where and when: Donated by Jarritos. Color: Light fluorescent yellow-green. Similar to Mountain Dew. The flavors may be all natural, but that color is only found on poison dart frogs, I think. Scent: Tart, sweet. Sweeter and stickier that the scent of Sprite or 7-Up, but a little more tart than the smell of Mountain Dew. Taste: About like it smells. Closer to Sprite than I would have guessed, but with a bit more syrup. To me, most of the lemon-lime sodas have tasted mostly of lemon; this has more lime, and then throws some more sugar in. Between Mountain Dew and Sprite. K-i-C: *grimace* "Like Gatorade, only less salty". Actually, fairly nice. The aftertaste is sweet and pleasant, almost floral. That's quite a surprise; in my experience, aftertastes are rarely good. K-i-C: "It's the color that gets to me. The taste is nice, but the color is Repo Man-ish." Interesting. The Junior Assistant Taster is typically very fond of--well, almost anything sweet. I wonder why this is an exception. Quaff rating: 3.5. Nice, with an especially pleasant aftertaste. Actually lemony and lime-y. Cough rating: 0.5. Just a hair syrupy.